Florence Italy Hotels | Travel to Florence.com, your online travel guide. One Star - Very limited in size and usually having a small number of total rooms. Most one star Florence Italy Hotels have shared bathrooms and the amenities are minimal. Two Star - Good value to price ratio. 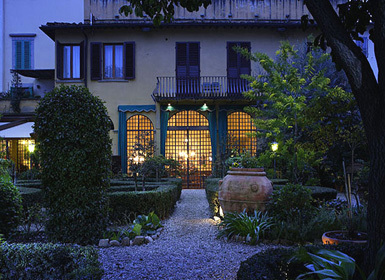 Two star Florence Italy hotels are budget hotels that have a simple elegance and are unpretentious. Two star hotels may still have shared bathrooms though not often. They offer more amenities than one star hotels and are usually family run. Three Star - Also good value to price ratio. Three star Florence Italy hotels offer consistent quality and are probably the most preferred by travelers. The prices are still not expensive and rooms have en suite bathrooms, cable television and are usually equipped with hair dryers, safes etc. Four Star - Usually considered a 'business class" hotel. Four star Florence Italy hotels offer large rooms and all the amenities that a traveling executive would need. Four star hotels are held to a high standard of quality and their price usually reflects it. Five Star - The most prestigious accommodation. Five star Florence Italy hotels typically have beautiful public areas and rooms with elegant furnishings. Five star hotels offer the highest level of quality with services such as spas, concierge and fine restaurants. 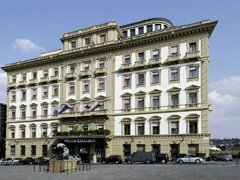 Florence is home to two of the of the greatest hotels in the world, The Rocco Forte Hotel Savoy built in 1896 and the Weston Excelsior built in 1863 (was once a 15th century palace and home to a noble Florentine family). While most of us will never be able to afford to stay at either of these hotels there are plenty of three and even four star hotels that regularly have specials to make it possible to stay in "affordable elegance". Most of the more expensive hotels will be in the city center near the main attractions while a lot of the more affordable one and two star hotels will be slightly farther out near the Santa Maria Novella train station or in the Oltrarno across the river. The Oltrarno is a wonderful place to make your base with its amazing restaurants, piazzas and churches. Staying in the Oltrarno will give you a first hand view of daily life and the rich history that is still evident in the quarter. Hotel prices are more reasonable and you will be just across the bridge from Florence's city center. Most of Florence's antique shops and artisan workshops are still located in the Oltrarno and San Miniato Al Monte Basilica is a must see with its afternoon vespers and amazing cemetery. Here is the absolute best hotel search tool! This tool will let you compare the price for any Florence Italy hotel room from every travel site. You will also be able to view pictures, read reviews from other travelers and securely book your room, all in one place. Maggio Musicale Fiorentino- "Musical May"- Italy's oldest and most prestigious music festival. Calcio Storico- A wild, almost modern day gladiatorial contest between two teams combining rugby, soccer and wrestling. Held annually between June 24-28. Estate Fiesolana- "Summer in Fiesole" - Nearby Fiesole comes alive with a variety of dance, music and theater performances in their amazing ancient Roman theater. Events run through September. Florence Dance Festival - International dance companies perform in the cities most beautiful outdoor locations, such as Piazzale Michelangelo and the Boboli Gardens. International Antique Show - Held in mid-September in uneven years. Want to know what's going on in Florence? Sign up for our monthly newsletter "The Florentine", to find out about upcoming events, deals and happenings! I promise to use it only to send you The Florentine.